When you’re buying a portable induction cooktop there are lots of things a salesperson won’t tell you unless you ask specifically. At The Equipped Cook we provide you with the answers before you’ve even thought of the questions. The most popular portable induction cooktop is a single induction burner. A single unit offers portability, it is easy to stow and you can always find room for it on your counter or table. We look at the best features on these appliances and review three of the most popular models. >> Want to see the latest Top-Rated Portable Induction Cooktops? Click Here. If you’re short on time, click on a link below for the review. Alternatively, just read on. What is a Portable Induction Cooktop? How Good Are Portable Induction Cooktops? Which Single Portable Induction Cooktop is Best? Can I use a portable induction cooktop in an RV? Can I use a portable induction cooktop in my dorm room? The best induction burner to use at home? Buying a portable induction cooktop for an elderly relative? Leaving your children with a baby sitter? Reviews On The Best Portable Induction Cooktops? For the price of a portable induction cooktop you get similar functionality to a built-in induction cooktop in your kitchen, but for a fraction of the cost. A single portable induction cooktop works the same way as an induction cooktop that is built in to your counter. A range with an induction cooktop also uses the same technology. Instead of providing a heat source to cook, induction uses magnetic technology to induce vibrations in the pan you are using. It is the pan that produces heat, not the induction burner. The top of the burner only becomes hot from residual heat it receives from the pan. Induction cooking requires magnetic pots and pans. Stainless steel and cast iron are good. How do I know if a pot is induction compatible? Most pots and pans are labelled as induction-ready when you buy them. If you need to test the ones you already own this can be done with a small magnet. If the magnet sticks to the bottom of the pan it should be induction compatible. In addition to the ferrous requirement, the pan should also be flat bottomed. A curved shape or ridges on the bottom will not work with an induction burner. A portable model means it does not have to be hard-wired into your kitchen, nor does it have to be installed into the cut-out counter. A portable unit can be used in a kitchen as an extra burner when entertaining. You can use it for keeping a dish warm before serving. Place it on the dining table and you can serve directly from it. A portable induction burner can be used in an RV or motor home. It can be used in a dorm room or at a holiday house. When you select a single induction cooktop it is best to get one with 110V power. If you are looking at one which requires 220V, it is not easily plugged into a normal socket. For the price of a portable induction cooktop you can try induction cooking in your home without committing too much money to it. Portable induction cooktops vary a lot depending on power and features. For an affordable price, it is possible to buy one which delivers similar cooking results to a built-in induction cooktop which costs thousands of dollars. If you’re new to induction cooking you can try a portable induction burner in your kitchen without spending too much. And if you do decide to install an induction cooktop in your kitchen you can still use your portable model as an extra induction burner when entertaining. Also use it as a warming plate or at the dining table to keep food hot while serving. Before buying a portable induction cooktop take a look at the features below. Some will be important to you and others won’t. does it retain the heat setting if you remove the pan. If you want to use a portable induction cooktop as a warming plate you’ll be best with one that goes down to 100 watts on the lowest power setting or about 140 degrees Fahrenheit on a temperature setting. However, you would only use a heat setting as low as this if the food is already cooked thoroughly and you want to keep it warm until you serve it. Many portable induction burners do not go as low as 100 watts or 140 degrees so you need to check before you buy. If you want to cook at high heat you’ll need a portable induction burner that offers 1800 watts of power. For example, if you want to cook fish on a skillet and sear the skin of the fish you’ll probably need 1800 watts. 1500 watts may do the job but 1300 watts will definitely leave you disappointed if you want to sear at a high temperature. If you are going to use this appliance in an RV or caravan it is best to get one that has variable power options. If you know you’ll stow the unit away when not in use, you might be concerned about the base cracking. To avoid this problem the best portable induction cooktop will be a stainless steel one rather than plastic. The base does not heat up with induction cooking so it is only physical contact with the base that should be a concern for cracking it, not heat. 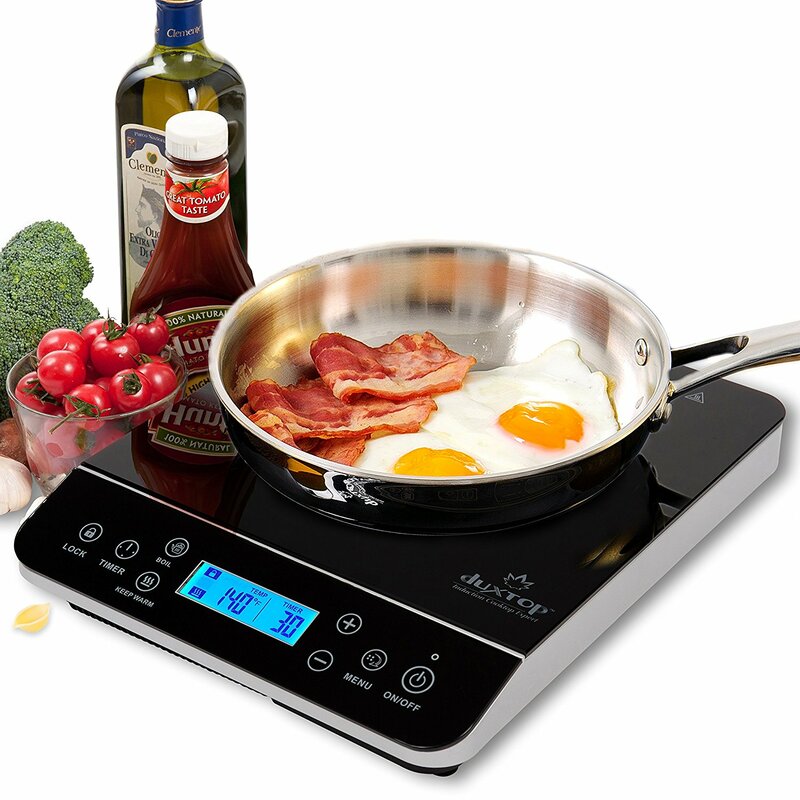 >> Looking for a cheaper induction cooker? At the time of writing, this one (shown below) was reduced. With good features, it’s great value. Click Here to see the latest price. If you want to use this type of burner in a dorm room it’s best to get one with safety features like overheating protection. A cooking timer to automatically shut off the induction burner after a specified time is also a great safety feature. If you are using it in your dorm room you may not want to sear food which will produce smoke and possibly set off a smoke alarm, not to mention annoy your friends. In this case consider a 1300 watt or 1500 watt model rather than the more powerful ones. Also consider the length of the power cable because you may only have one power outlet that it has to reach. If you are going to use a portable induction cooktop in your kitchen at home you’ll need to consider what you want to use it for. If you want to use a large saute pan you’ll need a larger cooking surface. For large pots of soup you will want a sturdy appliance that can take the weight of a heavier pot. Consider whether your main purpose will be as a warming plate before serving food. For warming you should choose a model with a very low setting (usually about 140 degrees Fahrenheit and/or 100 watts of power). If you are going to use it at the dining table you may want to look at the aesthetics in more detail. If you want to cook for long periods of time you’ll need to make sure your portable induction cooktop does not have a permanent safety feature which automatically turns it off after a certain number of hours. Some models have this as a safety feature but with the option to turn it off for long cooking times. This may apply if you want to spend a whole day canning or simmering bone broth for an extended time or cook a corned beef for a few hours. Give some thought to how you will use your portable induction cooktop before purchase. If you are buying an appliance for an elderly relative you may want to consider safety features as top priority when selecting a single induction cooktop. With an overheating safety shut-off you can ensure your loved one doesn’t let a pot boil dry or accidentally set fire to the kitchen by leaving a burner on. The safety features are also important if you are leaving your children with a baby sitter. To give you peace of mind, choose an induction cooktop with an automatic overheat shut-off along with pan detection so the induction burner does not activate if there isn’t a ferrous pan on top. If someone leaves another item on the burner it won’t operate and therefore won’t catch fire. You can also choose a model with a lock so children don’t accidentally turn the burner on. To help you short-cut the process on research we’ve included detailed reviews on four of the best portable induction cooktops available. If you want to use a portable induction cooktop in an RV, caravan or boat you’re going to benefit from owning the NuWave PIC Titanium Model. There are special features to control power usage and it offers a large cooking surface which is important if this is your only cooktop. How many watts of power? This model offers 1800 watts (15 amps) of power. This appliance plugs into a 110 volt socket. The temperature ranges from 100 degrees to 575 degrees for searing. The lowest temperature of 100 degrees means it is great for using as a warming plate. The temperature can be changed in 5 degree increments for accurate heat control. There are 94 temperature control settings. This portable induction cooktop can boil water in 60 seconds. To change the heat you press and hold the + or – button until you reach the correct temperature. There are also six preset heat settings for convenience. You can select Low (100 F), Med Low (175 F), Medium (275 F), Med High (375 F), High (425 F) or Max Sear (575 F). How big is the cooking area? The cooking surface of the NuWave PIC Titanium is 12.3 inches. This is much larger than previous NuWave models. Perfect for a large stock pot or skillet. The actual induction element in the centre of the appliance is smaller in diameter than the overall surface top. This means the outer edges of your 12 inch pan will take a little longer to heat compared to the centre. For the best results use a pot or pan with very good heat conductivity so the outer rim heats more evenly. The maximum weight the cooktop can take is 50 lbs. This is a total weight including the pot and what’s in it, including liquid. This is a very good weight tolerance compared to other single induction cooktops. This induction burner model offers several safety features. It will only operate if you use induction compatible cookware on the top. If you turn it on and there is something else on the top it will cease to operate. This is a safety feature. Non-ferrous items will not heat up and hopefully you can avoid an accidental fire. Items such as a piece of paper or a plastic bag will not activate the induction element. If you lift a pan off the top while cooking this portable induction cooktop will pause for up to 10 seconds. If you replace the pan within the 10 seconds it will continue to cook on the same setting without you needing to reset the temperature. This NuWave PIC Titanium Induction Burner offers delayed start. You can control the time you want you’re cooking to start even if you’re not there. There is also a timer function which lets you set the total time and have the unit automatically turn off. This is a great safety feature and it is worth setting a timer if you know you are multitasking or likely to get distracted. Overall, this is a very easy appliance to use. It has a clear digital display and it offers precise temperature control. It is very powerful offering up to 1800 watts of power if you need it. Once you become familiar with the correct temperature for your favorite recipes you’ll never want to use another cooktop. If safety is your priority then the Max Burton 6200 Deluxe portable induction cooktop may be what you’re looking for. This portable induction cooktop is ideal for dorm rooms, people with children or the elderly. This single induction cooktop has an overheating sensor. If the surface of the burner is heated to excess then the cooktop will automatically shut off. This may happen if an empty pan is left heating on the top. It may also occur if a boil-over is left unattended. There are a number of reasons why excess heat may be detected on the cooktop and the advantage of this model is the automatic detection and shut off function if a person is away from the appliance or can’t get to it. This feature could save a loved one from an accidental fire in their house or dorm room. Another safety feature is the timer. This is not just a kitchen timer. It is a cooking timer which turns the induction burner off at the end. The timer can be set for up to 180 minutes of cooking. You can even adjust the timer after it has commenced and during cooking time. The timer is easy to set and an advantage if you will be leaving the room or if you might be distracted. The Max Burton 6200 Deluxe portable induction burner has pan detection and will not turn on if a non-ferrous item is placed on the top. This is a safety feature because it will not heat random objects that are not be intended to go near a cooktop. Can you use a small pot on this model? The minimum size diameter of the bottom base of the pan to be used on this single induction cooktop is 4 inches. The recommended maximum diameter is 13 inches. The measurement always relates to the bottom surface which comes into contact with the cooktop and may be quite different to the diameter at the top of the pan. Like all induction cooktops the pots and pans you use need to be ferrous. Cast iron, carbon steel and ferrous stainless steel will be ideal. The bottom surface of the pan should be flat and smooth. When cooking the pan should be centered on the cooktop for the induction element to work. Does it show the temperature? This portable induction cooktop offers 10 power settings or 10 temperature setting, depending on your preference. If you like to gauge the heat by seeing a temperature readout this is possible. There are 10 settings from 100 degrees Fahrenheit up to 450 degrees Fahrenheit. The temperature setting should be used if a recipe requires the food to be kept at a particular temperature. Once the pan reaches that temperature the cooktop regulates its output to keep the pan at the selected temperature. If you do not need to keep your cooking at a particular temperature you should use the power setting alternative. There are 10 increments on this induction burner and they represent different wattage output. It ranges from 200 watts up to 1800 watts. The temperature of the pan is not regulated and the level of wattage will continue. The high power setting is very good if you want to bring a pot of water to boil rapidly. This induction burner can be used as a warmer on 100 degrees on the temperature setting. Can I stow this induction burner? If you are living in a dorm room, chances are you’ll want to put this induction cooktop away in a cupboard at some stage or even take it with you for holidays. This model has the advantage of the base being made from stainless steel, not plastic. Usually, on a portable induction cooktop, the plastic base is not a problem because induction cooking produces only residual heat and the cooktop itself does not heat up a lot. The plastic base is at little risk of cracking or melting. However, if you are going to stow your portable cooktop in a cupboard and you’re worried about it being pushed into by other items you may want to ensure you buy a stainless steel model. The Max Burton 6200 Deluxe is one of the few stainless steel models available. It can offer you peace of mind if you’re going to stow it. It also looks good. Overall, this single induction cooktop has very important safety features. The overheating protection is great for a dorm room or for a person who may be forgetful. For similar reasons it is also great to have a timer to shut off the appliance automatically at the end of its cooking time. If you have a babysitter coming into your home there are often risks associated with a gas stove being left on or even an electric stove being forgotten about with children in the house. If you provide a portable induction cooktop with overheating protection for the babysitter to use this can set your mind at ease. Even better, get the babysitter to always use the timer function and you’ve got double protection for your children. This induction burner also has ferrous pan detection so it won’t turn on without the correct pan on top. There is no flame and the hot surface cools down much faster than an electric cooktop providing a safer kitchen environment for your children when you’re not there. The Max Burton 6200 Deluxe portable induction cooktop offers great features for many people. It looks good in stainless steel and offers good control over your cooking with the temperature setting feature. If you are looking for a safer method of cooking, this portable induction cooktop is for you. When you use a portable induction cooktop at home there is a good chance you’ll want to use it on the dining table or for a buffet. If you are entertaining you want your induction appliance to look good. 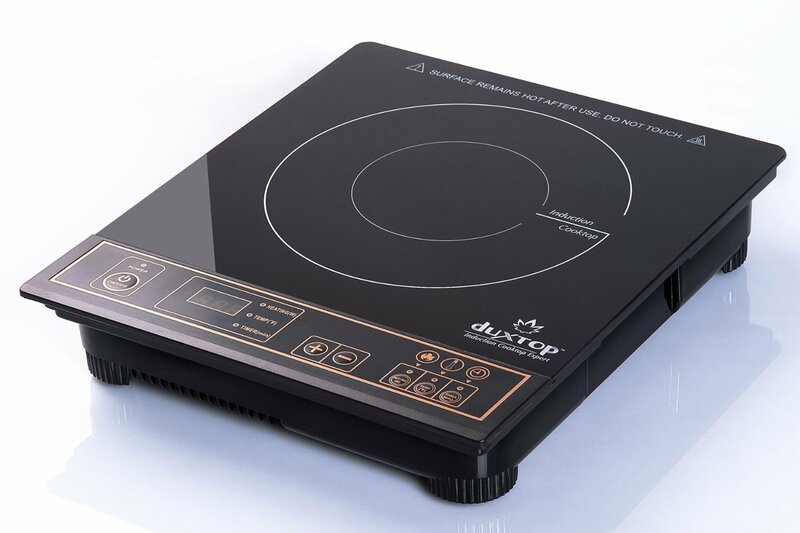 The Duxtop 9300 Touch Sensor portable induction cooktop has a full glass top, it’s aesthetically appealing and has all the functions you need. It is also perfect for travelling because it’s so thin. It’s 1-3/4″ thick. Some people take this induction cooktop with them when staying in a hotel room. Because this model is so thin you can pack it more easily than a bulky induction burner. It’s also great for using in an RV. Why does this model look so sleek? Compared to others, this induction burner has the controls located beneath the glass. It offers a touch sensor control panel which is different from the others that usually have blister buttons to press. The advantage of the touch controls is that there is only one smooth surface over the top of the induction burner. There are no blister buttons to wear out and cleaning is very simple. Wipe over the top and you’re done. With touch sensors it looks stylish and you’ll be happy to have it seen on a buffet table to keep food warm. Is it powerful enough to use at home every day? The Duxtop 9300ST offers 15 power levels from 100 to 1500 watts. It is powerful enough to sear meat, poultry and fish at a high temperature. The temperatures range from 140 to 460 degrees. It is capable of being used on either temperature mode or power mode operation. This means you should select temperature mode if your recipe requires the food to be cooked at a constant temperature. You can use temperature mode on the lowest setting to keep food warm on 140 degrees Fahrenheit. If you want to boil a pot of water fast it is best to use power mode. Power mode does not keep the food at a constant temperature. Rather, it keeps the wattage constant. If you set the appliance to power level 15 which is 1500 watts it will keep operating at this wattage even if the food continues to get hotter. I have children, can I lock the burner for safety? Yes. There is a child/safety lock on this model. It also has additional safety features. There’s overheating protection. If you’re using this cooktop in Power mode and it gets too hot it will automatically switch to Temperature mode. This is a safety feature. It will change the temperature to the lowest setting (140 degrees) and you can then adjust it after that. This safety feature will probably only kick in if you’re trying to fry or saute food at a very high temperature. The timer can be used to “set and forget”. You can set the timer to a desired cooking time and have the induction burner automatically turn off once finished. The timer can be set in 1 minute increments for up to 170 minutes. This is a great safety feature for families multitasking cooking with homework or other activities in the house. The induction burner will auto detect if you are using magnetic cookware. If you do not place an induction-compatible pan on the burner within 60 seconds it will not turn on. If you remove the pan you’re using, replace it within 30 seconds for it to resume cooking at the same setting. Are there limitations to this portable induction burner? The weight limit for the Duxtop 8300ST is 25 pounds. If you need to place heavier pots on your induction burner the NuWave model mentioned above can take up to 50 pounds weight. This portable induction cooktop will shut down automatically if no button or setting is changed for 120 minutes. The manufacturer states this is for safety regulation compliance. Therefore if you want to keep a cooker running all day, buy a different induction burner. Most users recommend using a 9-inch pan as a maximum size. This refers to the bottom diameter surface of the pan. Some 12-inch pans are actually only 9 inches underneath. The manufacturer does not provide specific dimensions for maximum pan size. The induction element is always smaller than the pan size on induction cookers, so it is important to use a conductive pan compatible with induction cooking. Who is this cooktop best for? This portable induction cooktop is very popular and suits a lot of people. There are plenty of safety features for families or people with pets such as cats. The child lock function can also be used to stop a cat accidentally turning the burner on! The shut off timer function is not only a safety feature but adds convenience. You can put a pot of oatmeal on while you take a shower or set the pasta to cook while you sit down and become distracted by your favorite tv show. The low temperature setting on this induction burner can be used as a warming feature and is great for entertaining and the high 1500 watts of power is good for high temperature searing. This single induction cooktop is particularly good for anyone who wants to leave it out on display either in the kitchen or on the dining table. Because it has touch sensor controls under the glass it looks good, flat and shiny. If you are going to be using it regularly in your kitchen to cook meals for a family there are no blister buttons to wear out. The continuous glass top is also very easy to clean because there is only one surface to wipe. The Duxtop 8300ST portable induction burner is ideal for a family kitchen or on your dining table for entertaining friends. Being ultra thin you can also pack it with you when travelling. It offers great value and is one of the most popular portable induction cooktops available. The first thing you notice that’s different between this Duxtop 9600LS portable induction cooktop and the Duxtop 8300ST (see above) is the forward slanting display control panel. The advantage of this, is you can use a large pan and still have easy access to the control panel. There is no problem with heat from a larger pan because the panel is slanted downwards. The cooking surface is 11.5 inches in square diameter. Obviously, like all portable induction cooktops, the induction heating coil is smaller in size than this. However, you can still use a large pan as long as you realize that the outer rim will take longer to heat than the center. Most people don’t have any problem with this. The control panel is a touch display made from the same material as the cooking surface. It is durable and easy to clean. Another difference is the brighter LCD display on the Duxtop 9600LS compared to other Duxtop models. This makes it a lot easier to read. What are the advantages of the Duxtop 9600LS? Two of the best features of this induction burner are the fast boil button and the keep warm button. This gives you quick access to these features. The cooktop can be used in power mode or temperature mode. When you press the Boil button it takes the cooktop to the power mode on level 10 (maximum). On boil mode the timer will automatically set to 10 minutes. If you press the keep warm button this portable induction cooktop will go to temperature mode at 140 degrees and the timer sets for 30 minutes. If you need the temperature lower it actually goes down to 100 degrees. In power mode there are 20 levels ranging from 100 watts to 1800 watts. And the default power setting level is 5.0. If you use the temperature mode there are 20 settings from 100 degrees to 460 degrees. The default temp level setting is 300 degrees. From the default setting you can then use the + or – button to change the settings on this portable induction burner. There is a child lock which requires you to hold the power button for 3 seconds before it will turn on. This is handy if you have young children or cats in your home because it won’t be turned on accidentally by them skimming a hand or paw across the controls. 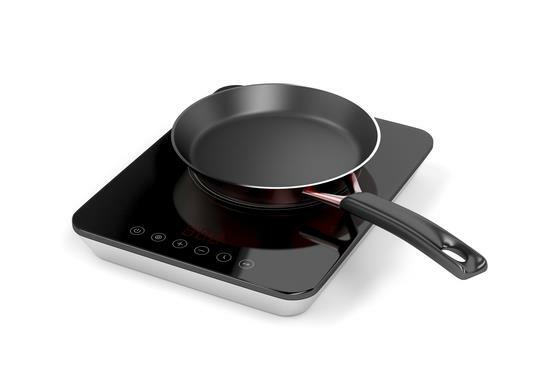 An automatic pan detection feature ensures this portable induction cooktop turns off in 60 seconds if the cooking pot is removed, or there is incorrect cookware placed on the cooktop. There is a low and high voltage warning system. I can’t imagine this would be necessary most of the time but it’s good to know it is there as a safety feature. It functions with a diagnostic error message feature. This helps to identify if there is an excessive high temperature or if the temperature at the surface level is greater than 460 degrees. This is also a handy safety feature especially if you have a habit of getting distracted and leaving a pot cooking at a high setting. Yes. The automatic timer can be set for up to 10 hours in 1 minute and 1 hour increments. When the timer finishes the induction burner panel beeps and shuts the cooktop off automatically. During cooking the automatic timer can be reset at any time for convenience. This timer is limited to being a auto shut off timer, there is no delay start timer like the sort you see on an electric rice cooker or slow cooker appliance. The feature I’m going to mention here is the same as the Duxtop 8300ST above. It’s a feature that can be seen as an advantage for safety or as a disadvantage because of inconvenience. If no buttons are touched or setting changed for 120 minutes this portable induction cooktop will shut off automatically. As mentioned above, the manufacturer states that this feature is in place to comply with safety regulations. I’ll leave it up to you to decide on whether its to your advantage or disadvantage but just remember you can’t leave this induction burner cooking over night without restarting it every 2 hours. This entry was posted in Induction Cooking on June 3, 2017 by Edwina. I have a single induction cooktop. Do you have any advice on learning to use it? The directions are less than adequate, so it’s been sitting in the box for about a year, now. Mine does have the automatic shut off when it overheats. I think my skillet was too big for the one burger I was cooking leaving the rest of the pan with nothing on it. The problem with the Nu-Waves is the case and thermal paste used for the temperature sensor. The cases are plain ABS which ends up becoming brittle over time and crumbling. The addition of glass-fiber reinforcement would have solved the problem or at least made them last much longer. The paste dries out, preventing the sensor from working properly. Thanks for your comment. I’d be interested to hear how many years you’re getting from your Nu-Waves.